Service Bus brokered messaging provides enterprise class asynchronous messaging capabilities hosted in Windows Azure datacenters. Asynchronous queue-based communication is not new to Windows Azure, the Windows Azure storage services have provided queues alongside table and blob storage since the release of Windows Azure. What is new is the broad range of capacities that Service Bus brokered messaging provides. The following concepts are used in Service Bus brokered messaging. All data communicated through the Service Bus brokered messaging services is encapsulated in messages. 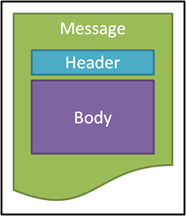 Messages contain the data that is being transmitted in the message body, and contextual information in a message header. Service bus queues provide a FIFO queuing model similar to MSMQ and the queues in Windows Azure storage services. Messages are placed on a queue by a sending application and received by a receiving application. Service Bus queues are provide durability for messages, meaning that the messages are stored in a durable storage system and are resilient to system failures. Service Bus queue provide options for deadlettering messages and message duplicate detection as well as sessions and correlation. Topics and subscriptions provide a publish/subscribe model for exchanging messages between applications. A topic acts as the enqueueing end of a queue, whilst subscriptions act as the dequeueing end of a queue. Subscriptions are created within a topic, and a topic can contain zero or more subscriptions. A sending application sends messages to a topic, these messages are then routed to zero, one or more subscriptions based on a set of rules. The receiving application can then receive messages from the subscriptions. Subscriptions can subscribe to all messages in a topic, or use a filter to subscribe messages based on values in the message properties. Subscriptions can also use actions to modify the message property collection.